Sunday, the weather changed and the rain rolled in. 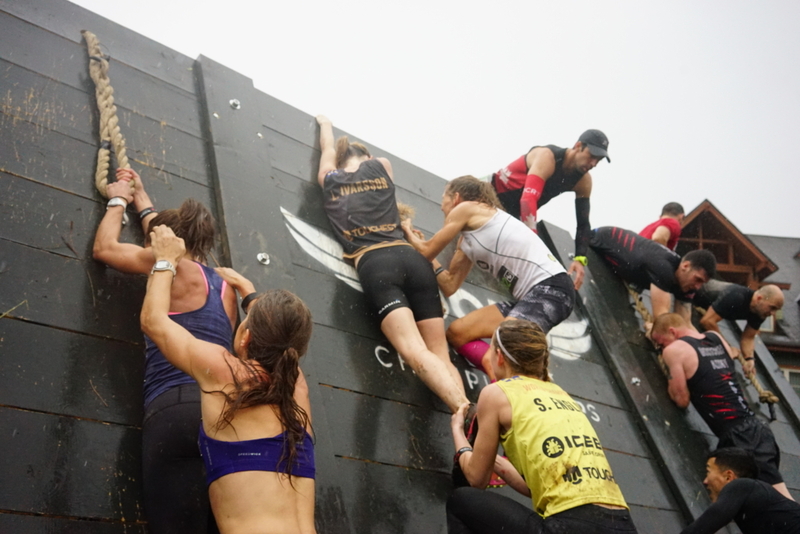 In fact, forecasts were calling for high probability of thunderstorms in the area, and because of this, staff at the OCR World Championships had backup plans B, C, and D ready… as you can imagine, climbing metal obstacles on top of a mountain is not a wise decision if there is lightning in the area. Fortunately, the weather gods smiled a little, and held off on the lightning and thunder at Blue Mountain, thinking it would be much more fun if everything was just slippery and wet instead, and rain showers varying in intensity from light drizzle to downpours occurred throughout the day. The day started off with the 2nd annual Team Competition, a highlight of the 2015 event. Teams of three would tackle a ~7k course in a relay-style race, starting with the “speed” specialist who would cover most of the distance and a few obstacles including Dragon's Back through the first part of the course before handing off the timing chip briefly to the “technical” specialist for the Platinum Rig. 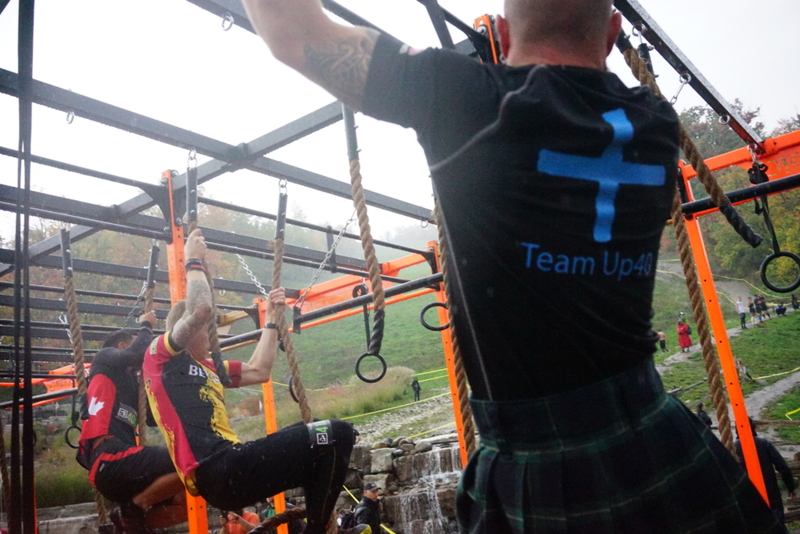 They would in turn tag the “strength” specialist who would do the Wreck Bag carry up and down the mountain – this time all the way to the top and back, twice the distance of the carry on the 3k and 15k race. 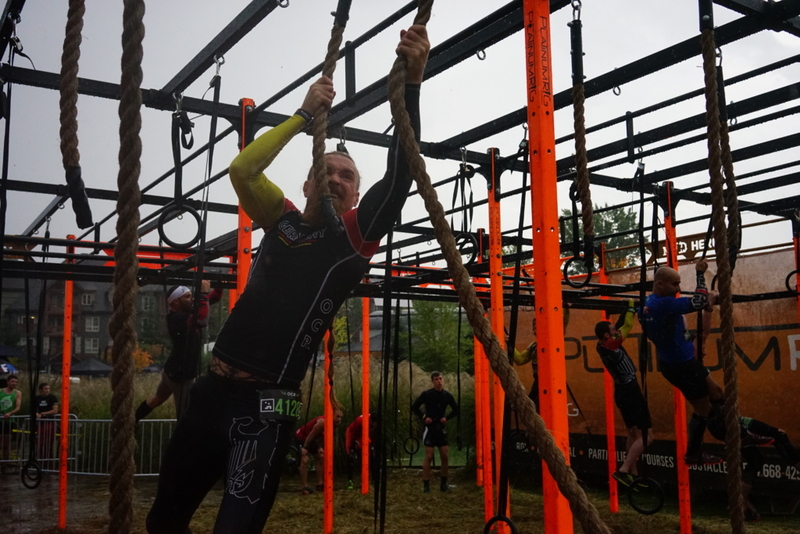 Once back down the hill, the timing chip would be passed back to the technical specialist who would do the 8′ wall, Dead End Race Monkey Bars, Irish Table, Indian Mud Run's Floating Walls, Skyline, and Urban Sky. Once past this gauntlet, the team would reunite to get over the last slip wall together using teamwork – with greatly shortened ropes from the day before. For the Pro Teams (Men's, Women's, and Co-Ed), there was again some significant money on the line as well as bragging rights. When they hit the trails, the rain poured down, turning them into a slippy, slidey, muddy mess very quickly. The results have already been posted elsewhere, so I'll skip ahead a little. By the time my team (team SISU) hit the course in the Open, Co-Ed field, the rain had let up. My wife Anne took to the course first, who was game to go even though she'd banged up her knee pretty badly during the long course the day before. 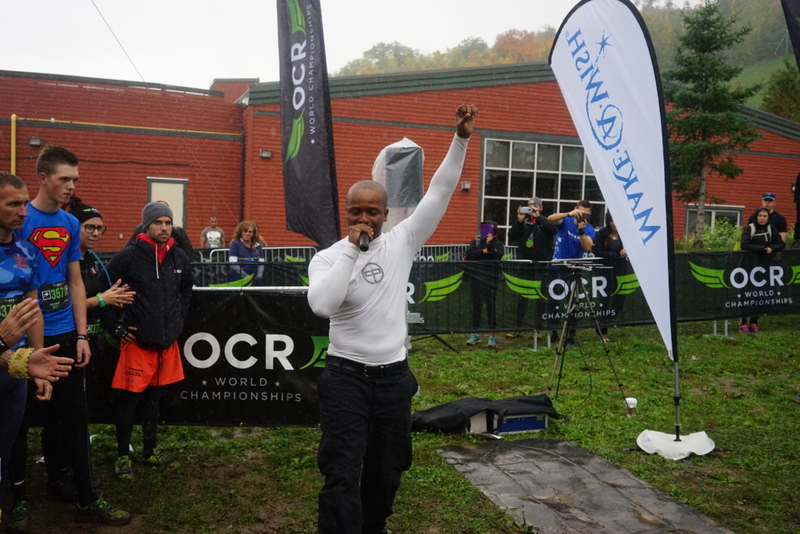 Knowing that she was moving slower than normal, I headed to the transition area, wrapped in my brand new OCRWC Dryrobe to keep warm (best purchase ever on a day like this), and chatted with a few friends there as we waited for our “speed” specialist to complete their part of the course. After awhile I spotted her slipping and sliding down the muddy course to the transition area. I grabbed the bracelet and wrapped her in the Dryrobe, then set off to tackle the Platinum Rig, which had been my nemesis in the earlier races. It had been reconfigured again, swapping out a couple of rings for ropes, likely as a concession to the rain, and with dual foot rings to start things off. My first attempt was pathetic as I misjudged the distance from the second foot ring to the bar and ended up with no momentum way too far to reach. My second and third attempts were much better, getting past this point and midway through before my grip slipped on the wet rings. 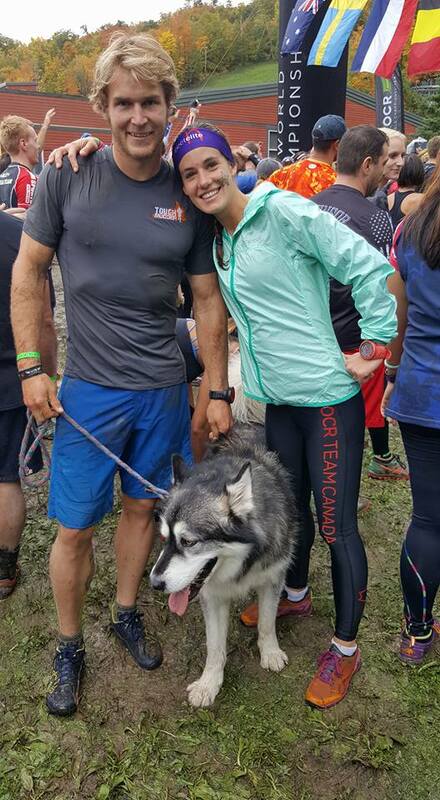 Apparently this would not be redemption day on this obstacle for me, and I let them cut that band off me again before I passed off the chip to our strength specialist Vanessa (the Nomadic Runner) for the long haul up and down the mountain with a 50 lb Wreck Bag on her shoulders. When she arrived back at the drop off point, I took the chip and I'd love to say I took off down the trail, but the reality was a mixed light jog and a ginger walk on the messiest bits as even my great trail shoes had almost no grip. Over the wall, across the now-dry Monkey Bars, heave over the Irish table once again, and through the floating traverse walls carefully as the footholds were now much slipperier than the day before. And I'm back at Skyline, the obstacle I hurt myself on Friday and had yet to complete. While waiting at the Wreck Bag carry I'd gotten some tips from a friend who was a gymnast, and these combined with gloves for a better grip on the handles and a decision to use a “switch-grip” technique got my bulk through this one for the first time all weekend. There may have been an exclamatory naughty word or three yelled as I hit the bell successfully. A smooth transition through the wheel and spiral monkey bars of Urban Sky, and I reunited with my teammates in front of the wall. As we waited for a turn, we assessed what other teams were doing. From my shoulders, Vanessa was able to reach the rope and pull herself over, then she helped Anne do likewise. Now it was just me with a big expanse of slippery wall. I took a couple of tries to run and grab onto either the rope or to my teammates who were reaching back down for me, and there was zero traction on that wall at that time; I'm sure I didn't get halfway up. But this was the open heat, and there was no rule against getting help from other teams, so I asked for a boost from a stranger and got one. We crossed the finish line together, happy to be done. If I had one critique of this course, it's that I would like there to be more obstacles at the end for the team to conquer together (this part was, IMO, done better in 2015). That is by far the most entertaining and spectator friendly aspect of the team competition, and it shouldn't be too difficult to enhance that in the future. But this wasn't the end of the weekend, there was one more event left. The Charity Race, benefiting the Make-a-Wish Foundation. This was open to anyone without qualifiers of any kind, though the vast majority of participants were the athletes already there for the other races. Registration for this was kept open until the day of the race, and many athletes stepped up in the eleventh hour to take on the challenge and give back. Notable among those running for a cause this time were champions Ryan Atkins and Lindsay Wagner, who ran the charity race along with their dog, Suunto. 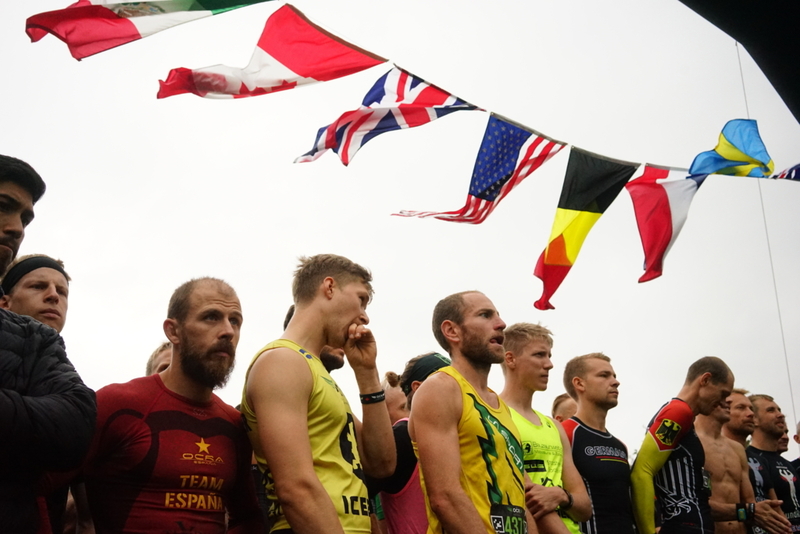 The weather and trail conditions caused the probably wise decision to limit this race to a shortened course of somewhere around 5k, with the wreck bag carry optional for those who wanted the extra challenge. No bands, no retry lanes, no competition, just people out playing on the course and enjoying the day and helping each other get through it. My one regret from this weekend is that I didn't jump in and do the charity race, but in honesty I was feeling pretty battered by then and the thought of more miles on the mountain filled me with dread. I did get to witness CoachPain give one of the most moving starting line speeches (among many) of the event while sending off a group of these athletes. My hat is off to all those who took part, and especially to those who conquered all of the events and brought home all 4 of the sweet medals available. 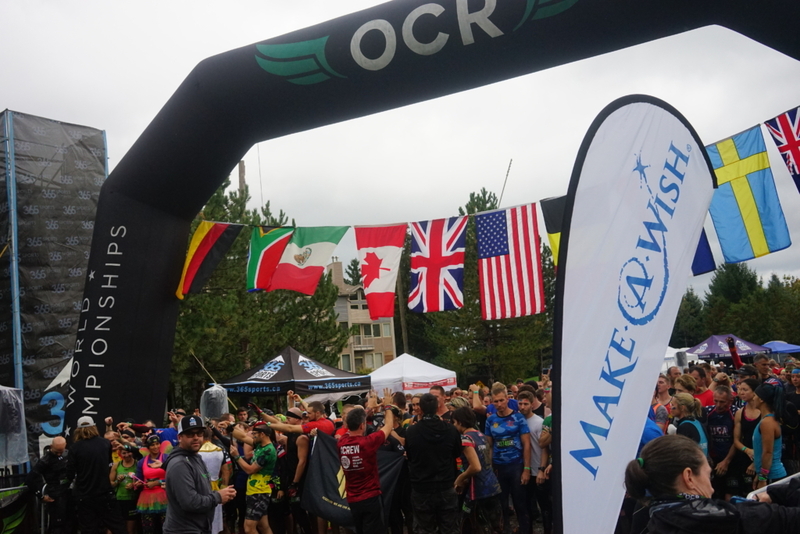 It's my sincere hope that OCRWC will head back to Blue Mountain Village next year; it is one of the best venues for an event like this that I can imagine, and the course designers and staff made full use of it to create a series of unforgettable events this year.